Our last inspection exposed that we had a hive without a queen. We left two queen cells hoping that at least one would make it into a queen for the hive. We checked our hive again, looking for a queen, looking for brood. We found no eggs, no larvae and a few pupa. We continued to do our inspection frame by frame, looking for the queen and some sign that she is laying. We got down to the last box, the final set of brood frames, where we had left the queen cells. There were so many bees that we had to shake them off the frame into the box to see what was happening on the frame. My husband and I now both inspect the frames. We each take a frame, alternating frames, inspecting concurrently so that the inspection time is cut in half. Still looking for the queen, my husband sees the queen on my bee suit pants leg. He said ‘there’s the queen, on your leg’. What a surprise! Truly, the new queen was on my leg. I gently move the frame I was inspecting over to my pants leg and she stepped on and I placed her and the frame back into the box after observing her for a moment. Whew! We have a queen! We didn’t find any eggs yet, but it’s still early. I’ve now read up on this and here is what I found out: Once a virgin queen bee emerges from her cell, she will look for other virgin queen bees, which are her rivals. The rival queen bees will attempt to kill each other and any other un-emerged queens until there is only one. There can be only one queen bee. Within the first few days, the virgin queen will fly out of the hive and look for drones. She will stay out and mate with around 12-15 drones, storing their sperm inside her for her entire life of up to 7 years. 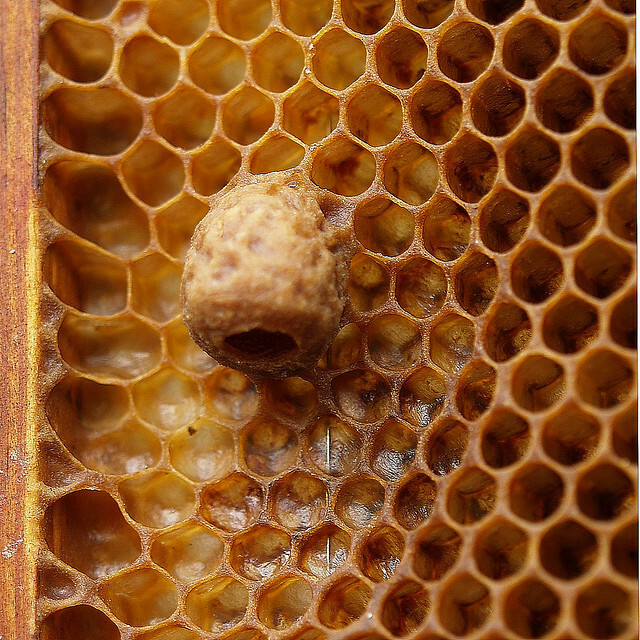 Once she gets back to the hive, she will start laying eggs within 2 to 3 days. This entire process can take up to 15 days from the day the queen emerges from her cell. So, it’s no wonder why we still don’t find any eggs. We are just very happy to have a queen back in the hive. We’ll give her some time and check back later. Gallery | This entry was posted in Bees and tagged Beekeepers, Beekeeping, Bees, Hive Inspection, Queen Bee. Bookmark the permalink.